Review date: 26 September 2005. It's one of my Special Things that's always in my pocket. I get upset when I don't know where all three of them are. I do not, however, actually use the pen all that much. I type like the very wind on my fetishised keyboards, of course, but my handwriting was never pretty, and has deteriorated further from lack of use. But it's still frequently useful to have an ink-applying device to hand, provided it's small and reliable and won't leak in your pocket. ...but a quick pull produces a ballpoint pen. ...or remove the end of the short pen to reveal a Delrin PDA stylus. The Inka's got a pressurised cartridge so it'll always use all of its ink; the gravity-independent cartridge also means the Inka will write upside down, or in zero gravity. It writes underwater, in case that matters to you. It writes in very low temperatures. So if you're ever upside down in a flooded cold place in space, it's got you covered, though you may at that moment have more pressing issues than whether or not you can jot down a shopping list. Persons with a passing familiarity with pocketable gadgets may, at this point, be thinking that all this sounds a little familiar. It's the same specification list as for the rather well known Fisher Space Pen. 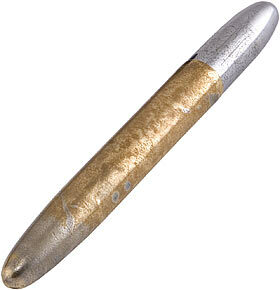 The original AG7 "Astronaut" Space Pen - the one that went to the moon - looks like, well, a pen. But the later "Bullet" model (which, like the original model, is available in about 300 different versions; obsessive collectors will end up bankrupt) comes apart like the Inka. I know this, because my pocket pen is a Fisher Bullet. It's logged about 65,000 hours of pocket time by now (and that's just while I've been wearing the pants), which is why it's more brass than chrome. Still works fine, though, and has only been through a few cartridges, thanks to my occasional use of the thing and the legendary longevity of the pressurised cartridges. ...and open, and they're about the same weight, too; the Inka weighs 16 point something grams, while the Bullet's 17 point something (it rounds off to about 0.6 ounces each). Apparently there'll be an Inka around four grams lighter soon - its metal parts are, of course, made from titanium, the first-choice material whenever anyone wants to unnecessarily lighten a consumer product. 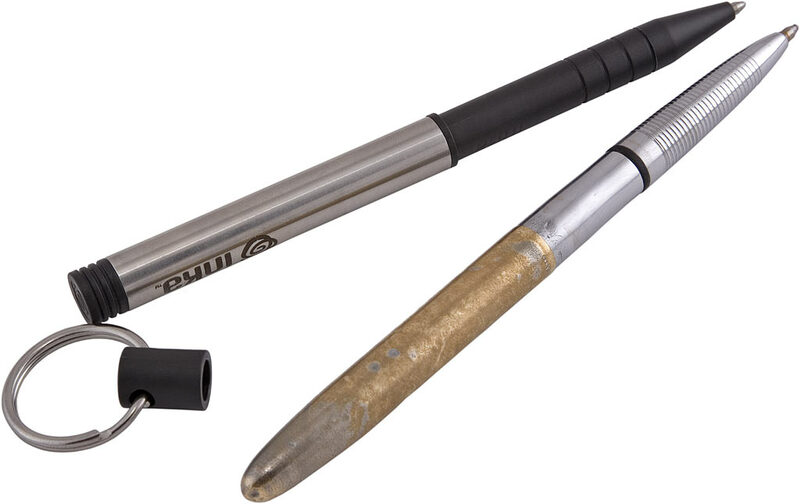 To make a full-sized pen out of a Bullet, you just pull the cap off one end and stick it onto the other end. To do the same thing with the Inka, you pull the pen part out of its cap, unscrew the body of the cap from the key-ring bit on the end, unscrew the cover over the stylus end of the pen, push that cover into the end of the body of the cap, then screw the cap-body on where the stylus cover came from. That's a total of four parts, one of them very small and loseable (so's the key-ring end, if it's not attached to your keys), and a combination of screwing and pushing operations that'd delight a Freudian analyst. And the advantage it gives you over the far simpler Fisher option is... well, maybe better water sealing, but water can't do much if it gets into either of these pens, so that's no big deal; my Bullet's been through the wash a couple of times. The Inka does have that PDA stylus thing, of course. If that matters to you, though, there are various Fisher pens with styli now. 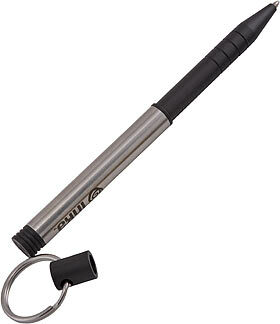 Fisher don't, however, sell a key-ring pen. They've got versions of the Bullet with slide-on pocket clips, and neck chain versions (which might be key-ring-adaptable), and they sell a wallet with a Bullet pen pocket, among their other more peculiar products. But if you want a Fisher pen with a key-ring, I think you're out of luck. This is just a tad nit-picky, though. The Inka and the Fisher Bullet really are pretty much the same product, as far as I can see. They even feel the same when you're writing with them. Neither exactly glides over the paper (pressurised pens use gooey ink), but the fine-point black cartridge in my Space Pen writes about as smoothly as the Inka (which comes in any ink colour you like, as long as it's black). 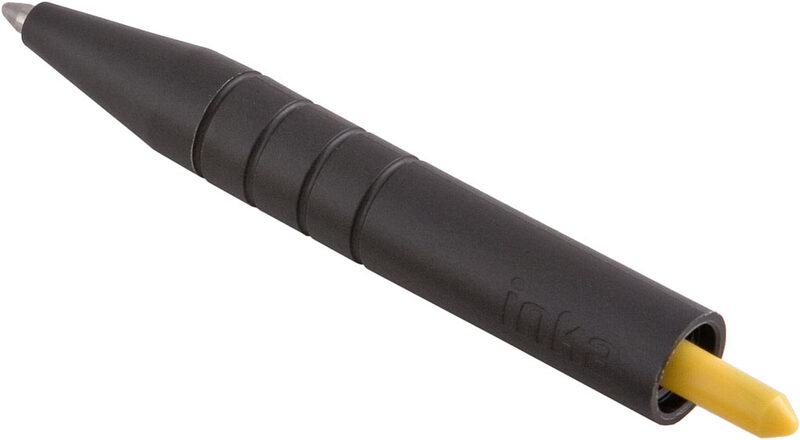 Inka Corporation are, of course, a little... coy... about the Fisher pens. As in, they pretend they don't exist. Exactly one of the reviews Inka included in the press kit they sent me (I love it when the press kit weighs six times as much as the product...) admitted to the existence of the Space Pen (and to the loseability of the Inka's small parts). 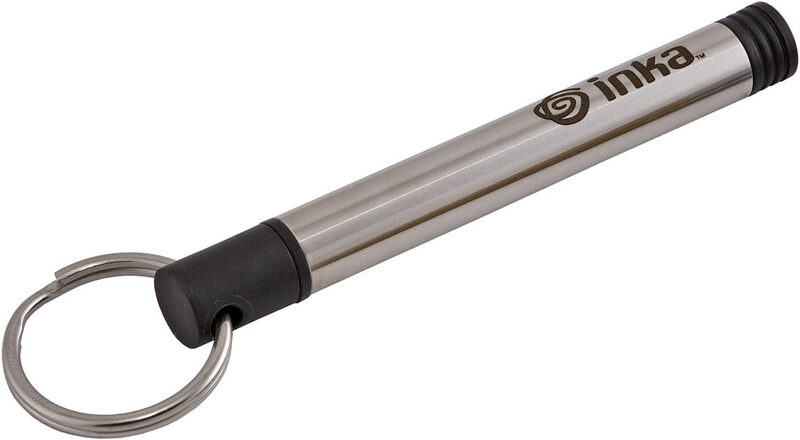 Presumably Inka let that review in because it says "But the Inka delivers"... on the upside-down-underwater-in-space claims, implying that the original Space Pen doesn't. When, of course, it famously does, as one or two people have discovered since the LBJ administration. The closest Inka themselves come to admitting that they know Fisher exist is a bit in the PR blurb sheet they included with my press kit, which says "Down the road, when other products' shiny coatings have worn off", the Inka's unplated steel will still look good. Personally, I rather like the fact that my Bullet's shiny coating has worn off. I've got some fresh shiny ones on my Emergency Present Pile, but I much prefer the well-loved one. Your mileage may vary. The Inka blurb sheet also says "the stainless steel barrel is hardened to a full temper" which confused me. Tempering is what you do to metal after you thermally harden it, to make it tougher and less fragile, or to overcome work hardening. But the 304 stainless Inka use for the pen is austenitic steel that can't be hardened by heat treating in the first place. Inka assure me, however, that this is a normal technical term for maximally work-hardened stainless. Not that anybody needs a pen that's been forged by a blacksmith to the samurai anyway, of course. Inka's PR people insist they've "developed a new product category of writing instruments". No they haven't; the Space Pen's almost 40 years old. And Inka's "environmentally responsible" pen may be "built to last a lifetime" but I don't think any replaceable-cartridge pen makes a perceptible impact on the environment. The Inka's $US25 plus $US4.95 shipping, for US customers. Shipping outside the USA's $US14. Inka refills are $US4 each, or $US13 for four. This is pretty much on par with Fisher pen pricing, if you buy from their Web site or some other full-retail dealer. When I bought three spare Bullets to put on my present pile, though, they cost me $US44.77 on eBay, including delivery to Australia. The delivered price for just one Inka is less than six bucks cheaper than that. In another eBay bargain hunt, I bought one standard black Space Pen, one titanium one, and five ink cartridges, for $US52.10 including delivery to Australia. Of course, if you're a normal human who only wants one pen, the price difference either way won't be a big deal. Since the Inka people are, of course, perfectly aware of the existence of Space Pens, and know that lots of other people are too, my thinking is that they'd go out of their way to point out their advantages over the opposition, if they had any. So they just pretend Space Pens don't exist, spout some promotional BS and hope to sell their basically identical product to people who've never heard of the 40-year-old competition. Then again, I suppose they wouldn't sell a whole lot of pens if they honestly described their product as "Like a Fisher, but fiddly, more expensive, black ink only, and with a ring on the end". The Inka Pen works well enough. But it's an answer to a question that someone else already answered before I was born. I can't figure out why they bothered to make this thing. 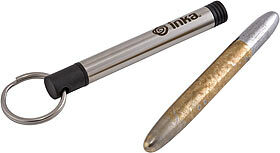 Review Inka Pen kindly provided by Inka Corporation.